Gibmiss: Virginias View " Valentines"
What a beautiful Valentine card (found the heart by the way LOL!!). Love the white stamped background on the kraft card! Fantastic finished look! We have sunshine here too but along with the cold...buts its dry so I dont mind that. Ooh Sylvie this is totally lush! What a stunning card! Beautiful! 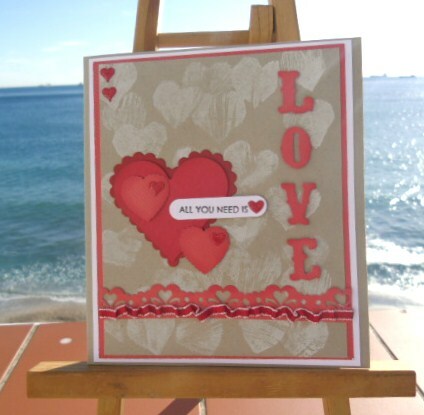 Love the heart stamped background, and the lovely colours you used! Sylvie, this is so pretty! I love your colours! The heart bkgd is just fabulous Sylvie, love the faux texture it gives :) Pretty card. Hi Sylvie! So glad that you found out about the V. V. Challenge! The heart design, background and border details are simply gorgeous! So glad that you play with us at Lily Pad!Hope to see your beautiful work again! Oh my, this is such a lovely card! I just love the white stamped hearts on kraft and those pretty pops of red! Gotta say it's hard to focus on the card with that fabulous ocean view in the background. So glad you joined us at the Lily Pad pond for the Virginia's View challenge!